When you first boot up JoJo's Bizarre Adventure: All-Star Battle, you'll likely head right into the story mode to start unlocking characters. Three hours later, you'll probably try versus mode, only to wonder where everyone else got all those cool costumes. The answer is the campaign mode. In it, you unlock the vast majority of the game's content—new taunts, poses, costumes, and outfit colors. The problem is that the so-called campaign mode follows the exact same micro-transaction model as Japanese free-to-play browser games. On the outside, the campaign mode is similar to modes found in several other fighting games (like the arcade of Soul Calibur II, for example). You enter into battle against a computer-controlled opponent who is based on another real player. The thing is, doing this takes a bar (1/10) of your energy gauge. And when your energy gauge is empty, you aren't allowed to continue playing and will be locked out of the mode—just like in popular Japanese social games. Now of course, the energy gauge does refill by itself. At launch, you gained energy at the rate of one bar of the gauge every 20 minutes; but as your typical battle lasts a minute or two max, you'd still have 18 minutes to wait before that energy was replaced. Thankfully though, due to an update last week, the energy restoration speed is now four times faster—one bar of the gauge every 5 minutes. And while this has made the mode much more bearable, it is still relatively easy to exhaust your energy—especially in boss battles. As you play, you can randomly run into a boss. Bosses generally require several battles—and thus several bars of energy—to finish off. However, as they also tend to drop the items you are looking for—e.g., costumes, poses, and taunts—they are who you'll be trying to fight. (Though, it is quite possible to win the same rare item twice and thus find you have wasted your precious time and energy on the boss). To use your time more efficiently, you are also able to decrease the number of battles you'll need to finish them off by gambling more of your energy and thus doubling, tripling, quadrupling, etc., the damage you do to the boss' total HP. Though, win or lose, the energy you used is forfeit. Normal battles and boss battles are far from the only way to spend energy, however. As you play, short minigames pop up (like asking you to pick a card, etc.) and allow you to wager energy to get an item reward or a battle against the boss of your choice. You lose the energy regardless of the outcome, however. So, suffice it to say, energy—or rather, having large amounts of it—is the key to campaign mode. This is, of course, where the micro-transactions come in. As we have talked about previously, there are plenty of consumable (i.e., one-time use) items for campaign mode. Some raise your chances of encountering a boss while other raise your attack or defense stats. But if you want to unlock everything in a timely fashion, you'll be buying energy at 150 yen ($1.51) for five bars. So in the end, if you want to play single player or online versus, JoJo's Bizarre Adventure: All-Star Battle is like any other fighting game. But if you really want all the bells and whistles the game has to offer, you're going to be spending either a lot of time or a lot of money. 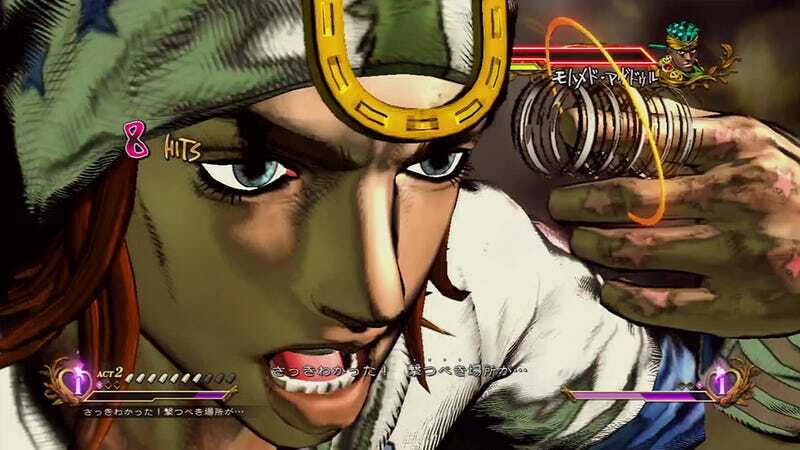 JoJo's Bizarre Adventure: All-Star Battle was released in Japan for the PlayStation 3 on August 29, 2013. There is no word on an international release.